Phoenix Wright is the most badass attorney next to Law & Order's Jack McCoy. He's so awesome that he even has his own musical, where he's portrayed by a woman in drag. But that's just hearsay from an overzealous witness violating spousal privilege*. Here's the real testimony regarding Ace Attorney's transition to WiiWare. *Yes, I would totally marry that game if such a thing were possible. 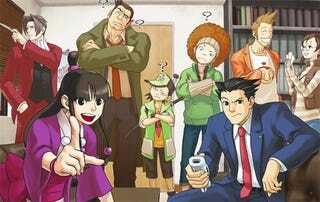 Phoenix Wright: Ace Attorney was a crazy-popular adventure crime-solving game for the DS in 2005 where players gather evidence to present at trial to convict criminals. Now it's being ported to the Wii via WiiWare in all its investigative glory. I played through a segment late in the trial where the murderer in on the stand spouting lies for Phoenix to rip apart. It's a straight port with no fancy extras or overhauled graphics, so consider the game done. Ace Attorney hits the United States in January with Justice for All and Trials & Tribulations following in March and May respectively. The bonus fourth episode will also drop in May for an as-yet unspecified low price. Annoying Background: Observe the screen and note that little gray border with the Phoenix Wright logo on it. Now imagine that background is actually moving gradually to the upper left hand corner of the screen throughout gameplay. Yeah, kind of distracting, isn't it? OBJECTION!!! The most amazing thing that's been done to Phoenix Wright on WiiWare is adding motion controls – or rather, motion control, because there's only one. It comes when you want to throw an objection out during witness testimony. Now, you could just open up your evidence file and press A to select evidence and then A again to present – or you could press to select and then fling your hand outward a la Phoenix himself to trigger OBJECTION! Which do you think is cooler? Capcom is really supportive of WiiWare between this and Mega Man 9. As long as they don't jack up prices or chop up individual Phoenix Wright games into tiny episodes (which is almost the same thing as jacking up prices), I support the decision to port awesome DS games to WiiWare.